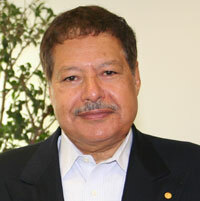 Dr. Ahmed Zewail is the Linus Pauling Chair Professor of Chemistry and Professor of Physics at the California Institute of Technology (Caltech), and the Director of the Moore Foundation’s Center for Physical Biology at Caltech. He received his early education in Egypt and he completed his Ph.D. from the University of Pennsylvania and a postdoctoral (IBM) fellowship at the University of California, Berkeley, USA, before joining the faculty at Caltech. On April 27, 2009, President Barack Obama appointed him to the President’s Council of Advisors of the White House, and in November of the same year, he was named the first United States Science Envoy to the Middle East. Dr. Zewail was the sole recipient of the 1999 Nobel Prize for his pioneering developments in femtoscience, making possible observations of atomic motions during molecular transformations in femtosecond, a millionth of a billionth of a second. More recently, he and his group have developed the field of 4D Electron Microscopy for the direct visualization of matter’s behavior, from atoms to biological cells, in the four dimensions of space and time. A significant effort is also devoted to giving public lectures on science and on the promotion of education and partnership for world peace, and he continues to serve on national and international boards for academic, cultural, and world affairs. For his contributions to science and public life, he has garnered other honors from around the globe: Fifty Honorary Degrees in the sciences, arts, philosophy, law, medicine, and humane letters; Orders of State and Merit; commemorative postage stamps; and more than 100 international awards, including the Albert Einstein World Award, Benjamin Franklin Medal, the Leonardo da Vinci Award, the King Faisal Prize, and the Priestley Medal. From the Washington Post and Harvard University, he received the Top American Leaders Award, and from the President of France he was bestowed with the Ordre National de la Legion d’Honneur, Chevalier. In his name, international prizes have been established, and the AZ Foundation provides support for the dissemination of knowledge and for merit awards in arts and sciences. He is an elected member of academies and learned societies, including the American Philosophical Society, National Academy of Sciences, Royal Society of London, French Academy, Russian Academy, Chinese Academy, and the Swedish Academy. Recently, UN Secretary-General, Ban Ki-moon invited Dr. Zewail to become a member of a Scientific Advisory Board providing advice on science, technology and innovation for sustainable development.